I don’t like being unfamiliar or inexperienced when it comes to cooking with any given ingredient. That being said, I recently realized that I have rarely made use of leeks, especially as the main component of my dishes. So, I decided to challenge myself and make something with leeks. 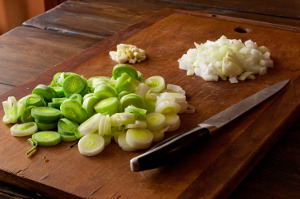 Leeks belong to the same family as onions and garlic. They have a taste that’s reminiscent of onions, except that the taste is much milder. 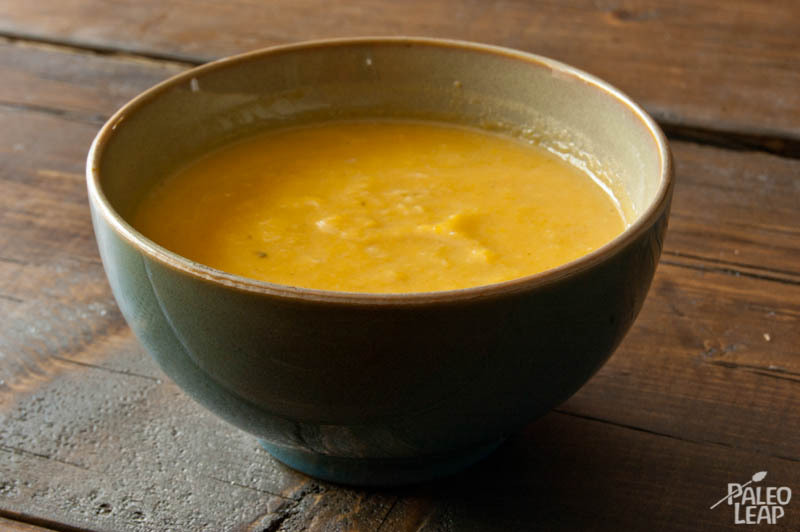 This leek and sweet potato soup is different from what it is like traditionally, but only because I chose to use sweet potatoes as opposed to a regular white potato. This changes the taste of the soup a lot. It makes it sweeter and softer in flavors. It is also works well with the soft flavors from the leeks. The main spice used, cumin, contrasts well with the soft flavors to bring a spicier side to the dish. When cooking with leeks always make sure you soak them or rinse them very well prior to use. They are often full of sand and this will easily ruin any recipe. You can cut them in half and run water inside the different layers of “flesh”. For this dish in particular, feel free to add one more leek into the mix. The top part of a leek stem is usually tougher and of a deeper green color, and that top part won’t be used in this particular recipe. That tougher part can easily be chopped and sautéed for another dish though. This soup is pureed at the end with a blender, but it can also be enjoyed with the vegetables still in chunks. Sauté the onions with the cooking fat in a large sauce pan over a medium heat for few minutes. Stir frequently to prevent the onions from burning. Add the garlic and leeks to the pan and cook for approximately 3-4 minutes to allow everything to soften. Sprinkle in the cumin and combine well. Add the stock and the sweet potatoes. Bring to a boil and than allow to simmer for approximately 10-15 minutes, or until the sweet potatoes are soft. Remove the soup from the heat and slowly mix in the coconut milk. Season with salt and pepper to taste. Puree the soup in a blender and serve.